Using Microsoft Intune, you can add or create custom settings for your Windows 10 devices using "custom profiles". Custom profiles are a feature in Intune. They're designed to add device settings and features that aren't built in to Intune. Windows 10 custom profiles use Open Mobile Alliance Uniform Resource Identifier (OMA-URI) settings to configure different features. These settings are typically used by mobile device manufacturers to control features on the device. Windows 10 makes many Configuration Service Provider (CSP) settings available, such as Policy Configuration Service Provider (Policy CSP). If you're looking for a specific setting, remember that the Windows 10 device restriction profile includes many built-in settings. So, you may not need to enter custom values. Name: Enter a name for the profile, such as windows 10 custom profile. Description: Enter a description for the profile. Platform: Choose Windows 10 and later. Name: Enter a unique name for the OMA-URI setting to help you identify it in the list of settings. Description: Enter a description that gives an overview of the setting, and any other important details. OMA-URI (case sensitive): Enter the OMA-URI you want to use as a setting. Value: Enter the data value you want to associate with the OMA-URI you entered. The value depends on the data type you selected. For example, if you choose Date and time, select the value from a date picker. After you add some settings, you can select Export. Export creates a list of all the values you added in a comma-separated values (.csv) file. Select OK to save your changes. Continue to add more settings as needed. When finished, choose OK > Create to create the Intune profile. When complete, your profile is shown in the Device configuration - Profiles list. In the following example, the Connectivity/AllowVPNOverCellular setting is enabled. 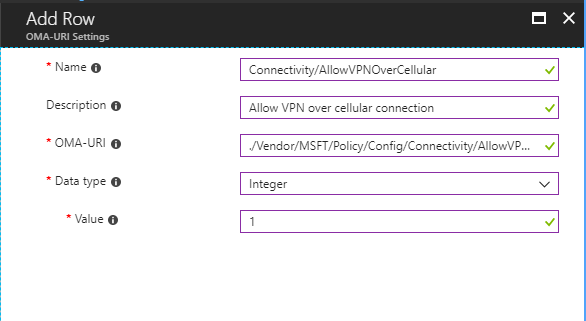 This setting allows a Windows 10 device to open a VPN connection when on a cellular network. There's a complete list of all configuration service providers (CSPs) that Windows 10 supports in the Configuration service provider reference. Not all settings are compatible with all Windows 10 versions. Configuration service provider reference tells you which versions are supported for each CSP. Additionally, Intune doesn't support all the settings listed in Configuration service provider reference. To find out if Intune supports the setting you want, open the article for that setting. Each setting page shows its supported operation. To work with Intune, the setting must support the Add, Replace, and Get operations. If the value returned by the Get operation doesn't match the value supplied by the Add or Replace operations, then Intune reports a compliance error. The profile is created, but it's not doing anything yet. Next, assign the profile.